These are extremely simple to make and require only the most basic of ingredients. The first thing you’re going to need is a bunch of leftover turkey! You can also use chicken if you’re reading this on one of the other 364 days of the year and it will be just as good. The basic premise for this recipe is to create the absolute bare minimum amount of batter needed to hold together as much delicious turkey and cheese as possible. As far as cooking goes you’ll probably just want to use a non-stick pan or a griddle. Whatever method you use for normal pancakes will work for these. If you want to get extra creative you could even give this a shot in the oven in a small cast iron skillet. That’s what we’ll be trying next! We basically try every recipe in a cast iron skillet… Cast iron skillet ice cream coming next week! I’m joking but a few of you believe me.. If you want to take these to the next level you’re going to want to top them with our fresh cranberry relish. 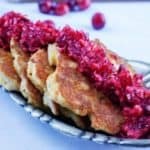 The sour and sweet flavors of the relish compliment these thanksgiving pancakes perfectly. Another great topping for thanksgiving pancakes is good old maple syrup!We’ve tried them both and they both work in their own way. In a bowl combine eggs and melted butter. Mix together with a hand mixer. You can use a fork/whisk as well. Add almond flour and continue to mix until combined. Fold in turkey and cheese. Heat a nonstick skillet over medium heat. Add cooking oil or spray to the pan to prevent sticking. Once pan is heated scoop in the batter. You may have to form the pancakes with the back of your scoop as this is a very thick batter. Cook for 5 minutes per side.